The Total-16 System is a lightweight, heavy-duty floor heating system that requires no screed and due to its thin depth of only 16mm is recommended for renovations where ceiling heights are fixed. It is designed to be used with Warmup’s 12mm PEX-A pipe, which is inserted into the insulation boards with integrated aluminium heat diffuser plates for greater radiant heat conductivity. The PEX-A pipe is at the heart of our system due to its strong, flexible and kink-resistant nature and also comes with our best warranties and guarantees. 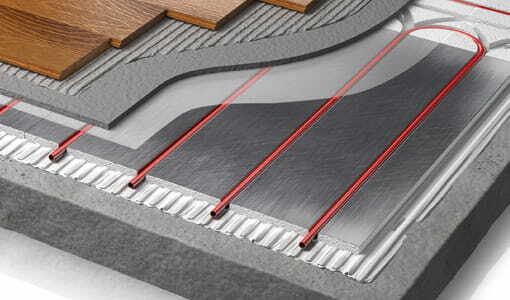 Minimal impact on floor levels – ideal for retrofitting and for installations on upper floors. Combination of insulation and spreader plates cuts heat-up times. Can be used for sole-source heating. Easy to fit and handle for rapid installation. Fits rooms of almost any size and shape. Total-16 is ideal for new-build and refurbishment projects where floor height is at a premium and installation speed is of the essence. Warmup’s Total-16 system is installed onto either concrete or wooden subfloors and can be used under almost any floor finish, including: solid and engineered wood, ceramic or stone floors as well as vinyl and carpet. The Total-16 system is comprised of insulated straight boards, with integrated aluminium plates, multi-feed boards and return boards. These boards are made of a high density EPS and can support 40 tonnes/m².